5 Methods for consolidating Credit card debt - Should you do it? Are you looking to consolidate credit card debt? I can certainly say from experience that I understand the discouragement you feel when you don't think you'll ever see the end of your debt. I think most people dealing with credit card debt have trouble knowing where to start. Debt consolidation isn't for everyone, but it is one option that could be just what you needed to finally become debt free! And before I get into the specifics, let me make one point very clear… consolidating your debt does not always mean going through a traditional debt consolidation company. There are other methods that keep the responsibility on you and don't have much of an impact on your credit score. Knowing if it is a good idea for you to consolidate credit card debt depends on your specific situation. 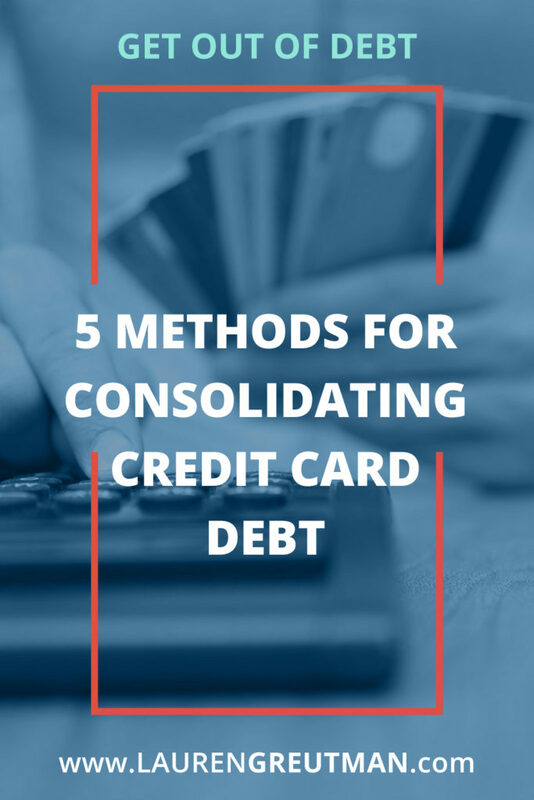 Here are 5 methods you should explore when considering debt consolidation. Is it a good idea to consolidate credit card debt? Here are 5 methods to consider…. Credible is a great option for consolidating debt. Basically, it is a personal loan that you would transfer all of your balances over to. It is easier to get approved with Credible than many others, but their rates are a little higher. So you would have to do some math and make sure that the interest saved would make it worth your time. Credible likes to call themselves the “kayak of loans”. They have partner lenders and you get to see what's available before you pull the trigger. In fact, one of my favorite things about them is that once you apply, their partner lenders only do a ‘soft' credit check which does not affect your credit score in any way. Click HERE to consolidate with Credible. Considering a personal loan to consolidate your credit card debt with SoFi might just be the solution for you. Their personal loan APR's start at 5.7% fixed. Which is way better than the average credit card interest rate of 16%. This would not eliminate your debt altogether, but you could use this method to consolidate credit card debt into one place with a much more manageable APR. This could cut years off of your payments! However, it is a little more difficult to get approved for a loan with SoFi than some of the other options. Click HERE to consolidate with SoFi. 3rd Method – Apply for 0% credit cards. You might not get approved for the full amount you need, and that 0% APR is probably just an introductory rate. That means if you don't get the card paid off by the time the introductory period ends, you could get slammed with even more interest. So, be careful and come up with a plan to pay off the whole balance in time. Another downside of applying for a new card is that your credit score might get hurt. And if your credit is already in bad shape and you get denied, you could be in even worse shape. If you're thinking of applying for a 0% credit card to transfer balances, you need to make sure you know your credit score first. If you're not sure what your credit score is, on Credit Sesame you can check your credit score for free. A 0% APR Credit card could be exactly what you need, just be aware of what you're getting into. Personally, I played the 0% credit card game when I was getting out of debt. And it worked out well for me. You just gotta be careful. Click HERE to check your credit score for FREE. This might be the easiest option, but “easiest” doesn't always mean “best”. I like to think of using a debt consolidation company as a kind of “easy out” because it really hurts your credit score. You are basically admitting to the credit bureaus: “I can't handle my debt myself”. And it kills your credit. Just make sure you get all of the details first and make sure your credit score can handle a blow like that before you commit to using a debt consolidation company. You may not need to consolidate at all. When you are considering if you should consolidate credit card debt, you might just be looking for a way to organize and simplify the process of paying down your debt. You also may be looking for an easy way out. You need to you tackle your spending habits first, and learn how to budget before you expect that loan consolidation will be the right thing for you. With a little effort, you may be able to manage it yourself. It can be done. You might just need a little push to get you started. If you need that push, you're in luck. I've made a tool that will give you your own personalized debt payoff plan! Click HERE if you're interested. Before you try and consolidate credit card debt, I strongly recommend seeing if a personalized debt payoff plan is just what you need. Our debt payoff plan allows you to put in all your debts, and see a debt payoff schedule based on whether you'd like to tackle the lowest balance first or the highest interest rate first. So, you have the option to decide which debt payoff method is best for you. Whatever you decide to do, just make sure you fight as hard as you can to get out of debt! You can do it! Don't give up! Why do you tell people to borrow to get out of debt? Hi Vickie – This post was to make people aware of options that could make sense to them. If you have multiple credit cards at high interest rates, it could make sense in a lot of situations to transfer them to a different loan at a much lower rate. But you have to do the math to see how much you would save in interest, and how long it takes to pay off.